Linet Masai is the world champion at 10,000m. She was just 18 when she won the crown in Berlin 2009. How does a girl from rural Kenya come to be so successful? Her brother, and bronze medallist, Moses puts it down to practice and hard work. Her coach, Ben Tumwet, puts it down to talent. Undoubtedly she had the natural raw talent for distance running, perhaps enhanced by having an arduous and long trip to school. Nevertheless it would have been all too easy for Linet to drop out of athletics. It is not a normal path to take; especially for girls who would traditionally not be expected to stay on school, let alone to pursue sport. The other part of the jigsaw is the influence that her teachers and the leaders of her school had on her. They gave her the inspiration and dream of success. Naboth Okadie, is the headteacher of Bishop Okring school. High up in the Mount Elgon district of Kenya, it is the school Linet and Moses attended and at which Eglah – featured in the World Class report From Kenya to Bedford and beyond – is currently a pupil. Naboth Okadie explains that keeping girls in education is a priority in his school. He is fighting against social and family pressures on girls, compounded with traditional issues such as early forced marriage and female genital mutilation (FGM). But within sub-Saharan Africa, Kenya is a positive story. The average age for a girl to marry in Kenya is 21 in the latest UN figures of 2008. Although the practice of FGM is still reported, it is now outlawed in Kenya. Okadie sees the role of the school as a key player in the development of the community it serves. It aims to raise the aspirations of all pupils, but especially girls, to change the way in which they see their future and place in society. For pupils like Linet and Moses this maybe continuing with the sport that they excel at. Or it may be, more simply, to enable pupils like Eglah to stay on at school and to see education as a means of improving their lives. In this the role of the teachers and school leaders is paramount. Pupils take their cues from people they see as successful. These maybe athletes, but it is also teachers. In 2009 UNESCO reported that, in Kenya, 50% of eligible children were enrolled in secondary schools, compared to over 80% in primary schools. In 2000 these figures were 33% and 60% respectively. Kenya has a greater percentage of children in secondary school than any other country in sub-Saharan Africa. These figures are the roughly the same for boys and girls at enrolment although girls leave, on average, one year earlier. The situation is different for education beyond secondary school. Here for every five boys who continue, only three girls do. Does this reflect the fewer female teachers that students see? Reporting on teacher education in Africa, research carried out for the World Bank in 2005 points to the key role that female teachers and school leaders play as role models. In Kenya, only 39% of the teachers were women, compared to a global average of 48%. Nevertheless girls’ educational performance is better than in Kenya than in many other African countries. This is partly due, no doubt, to the attitudes of schools like Bishop Okring, and headteachers like Naboth Okadie. The Open University’s Tessa project is a programme of teacher education in sub-Saharan Africa. Its research found that particularly important for girls was the role models that female teachers provided. This has led to the Scottish Government financed Saltire scholarships to encourage more girls to become teachers in Malawi. The research also explored what it is to be a teacher central and southern Africa. Many of its findings centre on the esteem and respect given to teachers by pupils and families. In turn it notes the respect given by teachers to school leaders. Thus the attitude of the school leaders sets the tone for the school, and for its teachers. The attitude of leaders and teachers then set the aspirations for the pupils and, by extension, their families and the communities they serve. The Tessa research also found that teachers saw themselves as being key members of the community with a role that did not end at the school gate. Linet Masai is a successful athlete. The pupils at her school now see her as a successful woman. Moreover so do her family and the village and community in which she lived. It was the school leaders and teachers who persuaded her to pursue her dream. NAIROBI, Kenya, Feb 28 – The United States government appears to prefer Uhuru Kenyatta to Raila Odinga as the next President of Kenya after Mwai Kibaki retires, it emerged on Monday. Diplomatic cables released by whistle blowing website Wikileaks indicate that US Ambassador Michael Ranneberger wrote to his superiors in 2009 saying Mr Kenyatta’s ambition should be supported as it could be helpful in pushing the reform process forward. “Kenyatta may be encouraged to attempt a presidential run due to shifting political dynamics that make potential challengers seem weak. Interestingly, Kenyatta seems to appreciate the need to be seen as pro-reform, and we should encourage him to push for action on key reform issues,” the confidential cable by Mr Ranneberger states. He also says that Mr Odinga’s Orange Democratic Movement (ODM) seems both directionless and less united than before. “Odinga is increasingly perceived as feckless, unable or unwilling to govern effectively and move forward the reform agenda. There is growing disillusionment within his camp (as conveyed by key interlocutors of Odinga’s Orange Democratic Movement, ODM, party to the ambassador,” the cable reveals. The ambassador told his bosses in Washington that Mr Kenyatta had revealed his intention to push for police reforms and also changes in the office of the Attorney General. Mr Kenyatta, according to the cables, was privately pushing President Kibaki to implement reforms. “During a recent conversation with the ambassador, Kenyatta claimed that he is privately pushing Kibaki to carry out key reforms, particularly with respect to the police and Judiciary. It seems possible that given the clear public frustration with the slow pace of reform and our stated concerns – Kenyatta appreciates the need for him, KANU, and PNU to be seen as more pro-reform,” the cable states. In his assessment of Mr Kenyatta’s presidential ambition the envoy sees his elevation to the Finance Ministry portfolio as an endorsement by President Kibaki. “His appointment as Finance Minister was seen by many as an implicit endorsement by Kibaki; it provides a powerful platform for Kenyatta to pursue presidential ambitions,” Mr Ranneberger tells his bosses. The envoy also hailed Mr Kenyatta’s 2009 Budget and said the Finance Minister was using CDF Funds to cement support of MPs who are influential on its use. On the alliance between Mr Kenyatta and suspended Cabinet Minister William Ruto, the cable states that Mr Ruto has made a number of private visits to State House and he is in close contact with Mr Kenyatta. He says that tentative, behind the scenes cooperation between Mr Kenyatta and Mr Ruto is focused on a deal whereby the latter uses his influence among Kalenjins to facilitate the reintegration of the Kikuyu internally displaced persons in Rift Valley. In the cable Mr Ranneberger describes the Deputy Prime Minister as being far ahead of all other potential candidates from Central Kenya. Other contenders are not gaining traction. Minister of Security (Prof George) Saitoti is considered too old and not charismatic. Kikuyu dissident Martha Karua, the former Minister of Justice and head of the NARC-K party within the PNU, has not gained wide support in the Kikuyu Central Province. Vice President Kalonzo Musyoka is however seen as a potential standard-bearer if at the end of the day the Kikuyus decide that they should not field their own candidate. “However, that would be seen as a Kikuyu-Kamba condominium, which might well be worse than a straight-out bid by Kenyatta if he can get crucial support from the Kalenjin community,” Mr Ranneberger concludes. As the Ministry of Education releases the 2010 Kenya Certificate for Secondary Education exam results on Sunday, one candidate will be looking to excel after she defied some of her relatives and friends who did not want her to be in school for what they considered an extreme disability. But today Ms Pauline Kemunto Nyanaro is optimistic that she will receive good results that will allow her to continue with her tertiary education. Ms Nyanaro, 18, wrote the exams despite her incomplete development of both hands and a leg. Her hands end at the elbow while one of her legs ends at the knee. But you cannot beat her in hand writing. Despite the physical and financial challenges she faced, Ms Nyanaro struggled, determined to make her dream of becoming an accountant come true. Mrs Nyanaro, a sixth born of Mr Evans Nyanaro Ombui and Mrs Mary Moraa of Kiabiraa Village of Mageri Sub-Location of Nyamira North district is ever happy. Her family has eight children, four daughters and the same number of sons who have no physical challenges. When she was born with the missing limbs, her parents were shocked. But unlike some parents in the area, they did not hide her. Through the help of the ministry of education, Mr Nyanaro said he was able to access a rehabilitation school for her child at St Ann’s Nyabondo Rehabilitation Girls’ Primary School where she joined Standard One twelve years ago. She faced a serious challenge as she struggled to learn how to hold a pencil using two of her incompletely developed hands to write. In her KCPE, Ms Nyanaro scored 227 marks and was admitted to Kisumu’s Joyland Special Secondary School. During her first term in Form Four, Pauline scored 405 marks out of the possible 800 marks. She took position 14 out of 45 students. Come the Second Term, Pauline took position 10 in her class after scoring 415 marks out of 800. She was given grade C (plain) during her mock exams. She says she expects to get C+ (Plus) and above in KCSE. “I want to be an accountant because I like maths. 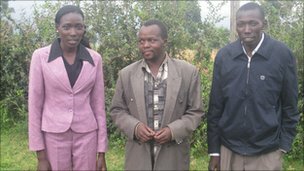 I hope I will get sponsorship to realise my dream once I receive my KCSE results,” she told the Nation at her home. Pauline was awarded a certificate of participation from Maseno National School in a mathematics contest in 2007. Although Pauline can dress her self, take bathe and perform a few basic chores, she says she is unable to wash clothes, cook or wash utensils. “I thank my primary and secondary school mates who helped me to wash my clothes,” she said. She also pays tribute to her parents for securing her an artificial limb that has helped her to move with ease. She said she could as a result visit her friends in their homes with ease instead of scrolling on the ground. “After completing my education I strongly believe I will get a man who will marry me despite my physical challenges since disability is not inability,” she said with a smile. He parents said they wanted her daughter to realize her dream despite being financially challenged. “I thank the World Vision for paying half of secondary school fees for my daughter. I will not also forget a Catholic missionary, Mr Stokuis who financially helped us while our daughter was in primary school in Nyabondo,” Mr Nyanaro said. Everybody the world over knows a joke or two about mothers-in-law, some funny, but most of them not at all complimentary at all. One would be forgiven for thinking that the father-in-law is an insignificant in-law who prefers to remain in the background even as his wife makes life hell for their son. Talk about having problems with your in-laws and it is automatically assumed that it must be your spouse’s mother giving you grief; after all, they are seen as the ‘ogres’ in any marriage, their main job being to meddle in affairs that otherwise do not concern them. The father-in-law on the other hand, is usually seen as the quiet authority who never shouts, never works too hard to assert himself, but leaves no doubt that he is in charge. Fathers-in-law having open disagreements with their children-in-law would be frowned upon, with everybody wondering why he is usurping his wife’s role. This is, however, not always the case. There are numerous cases of fathers-in-law trying to take over the day-to-day running of their children’s homes and some even going as far as having affairs with their sons’ wives. In most cases, these fathers-in-law are rich, arrogant, and any opinion apart from his own is considered unimportant. They run their families the same way they run their businesses; to them, their children are an extension of their successful businesses and just like in business, something that does not work is quickly discarded. According to Julia, the fact that she came from a different tribe was reason enough to be disqualified. Besides, he had already chosen a wife for his son, unaware that he was already dating Julia. Julia agreed to go ahead with the marriage only because her husband-to-be supported her. “After all, I was getting married to him, not his father, and I had no reason to suspect that my fiancé’s allegiance would ever change – I also hoped to win his father over with time.” But that time never came for Julia. She did not put up any resistance and moved to her mother’s house while waiting for her husband to come back. The father would not let us move back into the house as long as his son was still married to me, so we had to move to another house and start paying rent. Given a choice of what sort of father-in-law she would like, *Carol would easily pick Julia’s father-in-law because her own husband’s father, simply put, is a modern day Casanova who will chase anything in a skirt, including his son’s wife. What could the man have done to deserve such wrath? “I have been married for seven years, but things only became bad three years ago.” When Carol was dating her husband, he used to tell her how he would not be introducing her to his father anytime soon because he was afraid his father might steal her from him. At the time, Carol had laughed at the statement, thinking the father was a jester, but a look at her then fiance told her it was the wrong time to laugh. The next time she saw him was on their wedding day. By the end of the party, however, Carol saw him walk out with a girl who could have been his daughter – how disrespectful was that. Three years ago, Carol’s father-in-law visited their house – I was alone, my husband was out of the country. For 10 minutes, he kept trying the lock, telling me that it would be our little secret and that my husband didn’t have to know. I was in tears, and I was lucky when my house help, whom I had sent to shops, came back. He left soon after. Establish independence:– Move a respectable distance from them, it creates boundaries. Demonstrate oneness: Do not criticise your partner in front of your in-laws, do not allow him/her to be criticised either, and do not take sides against your partner. If you disagree with your partner’s behaviour towards your family, wait until you are alone. Accept your partner’s parents as your own and give due respect, but if they are like Carol’s father-in-law, keep your distance without being disrespectful. If, for instance, a wife wants to give her own mother some money, it would be better if she asked the husband to do it, and vice versa. This way, the respective in-laws get the message that there are no secrets in that union. Boys have taken eight slots of the top ten best performing candidates in the 2010 national examinations for high school. Moi High School Kabarak’s Wandui Albert Kamau emerged the best candidate nationally. He was followed by Marube Machuka (Alliance High School) and at No. 3 was Getega Obinchu (Maranda High School). Releasing the results, the Minister for Education Prof Sam Ongeri noted that the examination performance had generally improved. He said candidates who scored grade C+ (plus) and above needed to qualify for university admission increased from 81,048 candidates in 2009 to 97,134 candidates last year. THIKA, Kenya, Feb 21- Most people turn away when they see him; some won’t even sit next to him in a public service vehicle while others simply stare. But then that’s just how life has been for 19 year old Dennis Gicheha, who has a fist size tumor in his eye that has disfigured his face and almost cost him his eyesight. And Dennis who has known no other life just wants to live a normal life and become a doctor. For now however a Sh400,000 deficit stands between him and his dreams. “I was born normal but when I was two and a half years old, I developed a pimple on my head that wouldn’t go away even after treatment. It instead started growing and the size of my head increased,” he says. “When I was in class one, the headmaster discontinued my learning out of fear that I could seriously get injured. So he gave my parents an ultimatum to get me medical attention, first, before I could resume my studies,” he explains. By this time migraines had kicked in and his eyes would periodically pain. Dennis was then forced to seek further medical attention and Nairobi seemed like the Promised Land, in that regard. And after medical examination, the doctor’s verdict was immediate surgery – but that just remained on paper; the medical expenses proved too high for the humble family that calls Gatundu North home. Dennis had a tumor in his right eye. “When I came to Nairobi, I started raising funds for my treatment but it was never enough because I still had to buy medicine to help me cope which was not easy. Then in the year 2002, I got a sponsor who took me to Kenyatta National Hospital where I had an operation to take out the tumor,” he says. He stayed at the referral hospital for one year… waiting for his newly formed wound to heal. And after getting a clean bill of health, the 19 year old went back to school to pick up from where he’d left. But ill luck followed him and the growth was back. “When I went back to school around 2005 my eye started swelling again and I had to come back to the capital city to raise more funds and I still have to buy pain killers which cost me Sh2000 and last three months but the greatest gift would be good health,” he explains. Dennis now requires a second surgery whose cost stands at Sh500,000. He has so far raised Sh100,000 from Good Samaritans who he meets in public service vehicles. Once in a PSV, Dennis distributes flyers with a brief history of his condition hoping that someone will be kind enough to give him any lose pocket change. But even this is not an easy task. “Some people won’t even look at me when I give them my flyer; some passengers don’t even bother reading the contents of my flyer and throw them away and some bus conductors don’t allow me onto their buses. But at least there are those that take time to read them,” he says. The highest amount Dennis has ever collected was Sh1,300 which he put into his bank account. On a good day, an average of eight passengers donates to his cause. He’s also fully aware of the stares that he gets from people but he has somewhat become immune. “I tried wearing caps but I would look like a cartoon because of the tumor so I stopped. I don’t have many friends because of this illness but that’s okay- at least I have a supportive family,” he says. Dennis who has been in and out of school since the tumor started growing says his age mates are now in Form three. And although he knows he’ll never catch up with them, Dennis knows that he will one day achieve his dreams. “For now I just have to continue raising funds and I know I will get there. Doctors have told me time and again that my facial appearance will be restored once I get the surgery,” he says with finality. Dennis’ brother, Eric Njoroge, also wants him to get assistance. Njoroge who turns 25 this year says that he prays for his brother to become independent. Njoroge who has seen his brother live through the illness adds that some neighbors cite witchcraft as the cause and try to justify it. “Every time I walk with him people stare and ask a lot of nasty questions so sometimes it’s even hard for us to cope. But all I want is for Dennis to get treatment so that he can at least get eyes that look like mine. Because he cannot do anything with his eye in that condition,” he says. Mary Njoroge, Dennis’ sister-in-law also notes that the stares make it worse. “Dennis likes to walk but sometimes it becomes hard to walk with him because of all the silent questions. Then there are those who come up to us with all sorts of theories and it doesn’t matter how much explaining we do, because they would simply not understand,” she says. But with all these going on, the science loving Dennis who is also an ardent supporter of Manchester United still hopes and dream. His favorite food remains chips, chicken and a cold fanta pineapple. Are Kenyan women wearing the trousers? Eva Muraya: Not all Kenyan women are necessarily like the one described by the visitor, but I agree that compared to her Ugandan or Tanzanian counterparts, she does seem louder, more independent and confident. Dr Chris Hart: This is not a unique phenomenon. The Kenyan woman’s transformation is part of a worldwide trend. Education has been a key driver of this transformation and it has helped propel the success of this woman. Jane Karuku: The ability to achieve has always been there, even uneducated women display leadership traits. Our grandmothers made key decisions on who went to school, when land could be sold, etc. It’s just that they did not appear to be the ones making the decisions — it was always the man’s decision. Their confidence grew when they were left at home to fend for themselves as men went to the bush to fight the colonial masters. Ken Ouko: The focus is no longer on a partner for child bearing purposes but a partner for economic progress. Chris Hart: But urban women seem to be displaying this more, especially single women. The woman the visitor was talking about must be single. Pinky Ghelani: No, married women also go out and you can find them in groups enjoying each other’s company. I think the Kenyan woman has become extremely honest. When we want to go out we are bold enough to say so and we are honest about it. I think these other women are just not as honest. Eva: Before you become bold, you have to be honest with yourself. Kenyan women are now in a position where they can express what is happening inside them. They have become bold after this self examination, which is good. I know there are some who take things a bit too far but basically, I think it is because of this that many women are now able to express themselves and that scares the men a lot. Moderator: Let’s move on: What effect has women’s ascendancy had on marriage, family life, the workplace? Ken: There is a book I have out there in the market called Marriages Are Made In Heaven So Are Thunder And Lightning. Most of the stuff in the book is not the writer’s … most of it is a product, a result of what has been going on and in the Kenyan context two things have happened. The Kenyan woman is not just a wife any more. She is a partner, unlike other women in the region, and she is very honest about it and she negotiates her place in the marriage. That has not happened in Uganda or in Zambia where women there still have the “yes sir” mentality. Are you aware that Kenya ranks third in the world in terms of marital violence after Columbia and the United States? This is because the Kenyan man feels threatened by the woman’s increasing independence and batters his spouse and children to make his presence felt. But the Kenyan woman has shed the wife tag and is now a partner to the husband, and she’s not doing badly. She is not a competitor but a partner in progress. They are collaborating and saying “let’s do it like this” and the man is listening. But women between 25 and 35 are finding it hard to find a good male partner because they have become more confident, more demanding. Few men are confident enough to take them on in the marriage stakes, so my fear is that we are going to have a lot of single families. Moderator: What about the man? How does he react to this new woman? Is he just a bystander? Eva: I think a woman is not naturally domesticated but once she gets married with all the responsibilities that come with it, she buckles up and does what is necessary. In marriage we juggle, we multi-task but give credit to the men because they allow us to be who we are. I hear a lot of women say they hang out with girlfriends and visit them, something our mothers did not do a lot. What’s different now is that we take time for ourselves. When it comes to doing what we want, we have become more confident, and that probably is why we come across as arrogant. Chris: The problem is there are two sorts of men in this society. Those who have a job and those who don’t. How many of you ladies would marry an unemployed man? In a society where male unemployment is very high, men are going to behave differently, won’t they and an awful lot of women are not going to marry them, so when we come back to your comment a few moments ago that women cannot find partners, or they do not want to marry somebody who is unemployed. Now you could argue that the biggest change we could make to marital values in this country is to boost male employment but that is not government policy. Eva: Actually female unemployment is also very high. Most women don’t go looking for jobs, an awful lot of women follow their grandmothers’ example and stay at home. But you all want to marry an employed man, don’t you? For most women, it isn’t a case that they can’t find a good partner. When you’ve ruled out the unemployed, then you start examining what your goals in life are. Like if my goal in life is to have a good time, be independent and rise up the corporate hierarchy, then I better remain single and that is what is driving an awful lot of women to stay single until late in their lives. An awful lot of women are staying single for economic reasons, they want an income, they want the excitement of a career, they know they will only succeed in that if they are single. Ken: Many men are also afraid of confronting their wives. But a time comes when they explode and that is why there is so much domestic violence because they think the only way to subjugate a woman is to fall back on the traditional solution, which is to beat her. But this only creates disharmony because the woman feels unappreciated. But I agree with Pinky that there are a lot of partnerships where men realise that instead of fighting, the couple can cooperate and achieve a lot. Dr Njoki Fernandez: I will give an example of my own family because it illustrates completely what we are talking about. I got married when I was very young, at 21, and in medical school. So for a long time, my husband was provider, care-giver and whatever and it was a role he enjoyed and did very well. But fortunately or unfortunately, you complete medical school, get employed and soon the money starts coming in and this girl starts showing signs of independence. The man freaked out. Soon there were all these fights about “now you think you have your own money you can do your own thing”. I think I also took it a bit too far, telling him “don’t fuel my car, I can do it myself”. When I realised what was happening to us, I withdrew a bit and I allowed him to be the “one”. Now there is peace because I had taken over his role. Angela Ambitho: How old was your husband? Njoki: There’s a pretty well 19 year difference. But still, the point is that this is an experience from my marriage and it’s not something to debate…I realised that I was threatening to take over his role. If I go for a month without asking him for money, he panics because it is his job to provide. That’s a man’s job. I allow him to do his job, allow him to take me to the salon because he wants to do it. Angela: You know why I asked the question? In our research, one of the things we found as the catalyst for divorce was that people are marrying their age mates. If I am 30 and I marry someone of the same age, a problem usually arises because as a woman I think like a 35 or probably 40-year-old. My vision, my focus is so different from a 30-year-old. What then tends to happen is that as you compete in the job market, you start moving ahead but this guy will not reason like someone who is 19 years older than you. The only recourse for him is violence, he beats you. He has no other way of “putting you in your place”. What then happens is you react angrily. That’s what is happening in Kenya today in terms of marriage. If you look at the urban situation, you find that people often marry those they were at university with, grew up with, played with. I think that gap is necessary, a five, 10-year gap. But 19 years is bliss because you obviously look at things differently. Rhoda Orengo: I think Angela has said most of what I wanted to say but the difference is that Dr Fernandez had the wisdom to take a step back but with your age mate it will be difficult. He starts to feel emasculated and stops even trying. Philip Kitoto: I think there is also the issue of absence from the home. A large number of spouses are no longer available at home during the time they should be. Not just the men who go out drinking but women who are going to college in pursuit of that MBA. Moderator: Is this new woman happy? Ann Gitao: I will tell you a very interesting thing about happiness. We are not happier than our grandparents, or our great-grandparents, we are not happier if we live in a rich society or poor society. We all seem to come back to the same level of happiness. I will make you a broad sort of prediction that these ladies, no matter what path their lives have taken, are about as happy as their grandmas were. Your genetic makeup, your natural instinct is to be a mother, to be a wife, to be all those things and you can never scrap that. So I think you are only happy as a lady if you have that and you are feeling fulfilled. Hopefully, you end up with a good marriage and a good family and then on top of that you are living comfortably and living your other dream, your career growth. That’s what I’d describe as happy. I think it’s a completeness of some sort. So I would describe a happy woman as one who has fulfilled her natural instincts and continues to meet them and one who also meets her worldly needs and desires. Having said that I do think that if we look at this woman as we have described her, the career woman who is probably at her peak, 30, 35, 40 and unmarried, I am afraid to say I don’t think she’s going to be as happy as her mother when she is 50 or as her peers or grandmother because when it’s all said and done and her career is at its peak and she’s the CEO, she has no child and at the end of the day these are things that make us human. Pinky: You are right, for example if you talk to very old people they don’t describe the Mercedes Benz or house that they bought. They talk about their relationships. So yes, the woman or for that matter the man who fights to be CEO and never gets married, never has children, is not happy. We have to have pillars. And I think that we are uniquely created for relationships and when we do not succeed in the level and quality of relationships that we’re engaged in, whether between partners, spouses or even mother, father, sister and children then we are sad people. Mercedes or not, we were created for relationships, and those who subscribe, say to the Christian faith, know that it is about relationships. It begins and ends there, in between, throwing the Mercedes and anything else, but at the end of that journey, 60, 70, 85 years ends like his mother. Its about relationships, how at the end of the day. Pinky: I think the woman that we’ve described is constantly on the go and probably does not have enough time to sit down and ask herself whether she is really happy or not and I agree, I think she’s incomplete. She feels it, which is why she continues to look for things to achieve. She looks for challenges. I wouldn’t be quick to make that judgement because this point and time she probably does have, she has a boyfriend, right, she’s content, she has her power-say, she has her work but what I was saying is down the line she’s going to have pre-mature empty-nest stage, where she is really in a empty-nest all by herself and at that point as a human being whose a creature of you know humanity you cannot be happy. Moderator: What frontiers are left for her to conquer? Chris: I think one of the biggest problem is, the people are not very honest, not many people are in this area. I think when you survey people and you ask, are you happy, they usually say yes and single people say they are happy. Now they don’t say that they will be happier if they were also having a life they also wanted to live and they were married and whatever. So I think one often comes across people who say they are very happy being single, they’re very happy being CEO but they do know they miss something. Ann: But Chris having said that, just to reinforce your point, studies that have been done not so much in Kenya but in Europe show very clearly that one of the drivers for happiness is marriage. So married people are certainly much happier than single people. Single people may think they are happy. The tin shack looks like any other in a patch of small plots on the dusty outskirts of Nairobi. It’s the haunting sound that grabs you, the awful moaning and cries coming from within. It’s Thomas Matoke’s home. But it’s more like a cell. Matoke, 33, is tied to a steel bedframe with a piece of blue rope. He’s surrounded by pools of his urine, his mattress soiled and ripped to shreds. His moans are interrupted when he chews his hand or the bedframe. He can’t speak to tell his mother what he wants or feels. He’s alone in his world of screams and agony. He’s been like this for 30 years. Matoke got ill when he was a toddler and lost much of his high-level functioning. So his mother ties him up to prevent him from running away or hurting himself. Countless trips to doctors and hospitals haven’t helped him. And poverty means there isn’t much medical help his family can afford. Shunned by the community, Moraa does what little she can to ease his agony. Her life is consumed by trying to take care of her sick son. But Matoke is not alone. There are an estimated 3 million, mostly poor, Kenyans living with intellectual and mental disabilities, according to NGO and United Nations figures. As part of a special investigation, CNN found that families are struggling to cope with their loved ones, receiving little help from the state and facing massive stigma from society. CNN’s team filmed families locking up their loved ones, children discarded by institutions, cases of suspected sexual abuse. Kenya faces an epidemic of neglect. But often, Maina and her charity are the only ones acting. Scores of cases of neglect and abuse flood their office every day: autistic children chained in chicken coops, epileptic adults sealed in filthy shacks, daughters raped by their fathers. They are overwhelmed. He says that the greatest neglect comes from the Kenyan government. The Kenyan government spends less than 1% of its health budget on mental health, though its own figures show that one-quarter of all patients going to hospitals or clinics complain of mental health issues. And the Health and Medical Services ministries have been plagued by a series of corruption scandals in recent years. More than $3 billion in public money was stolen in 2009, according to the Kenyan Ministry of Finance. This could have funded the entire ministry responsible for mental health — for 10 years. The minister of medical services, Anyang Nyong’o, says mental health is a high priority, but it needs more funding from his central government. “It is definitely starved of resources, and that is not because we want to intentionally starve mental health; that is because the resource base as we have for running health services is very narrow,” he said. Whatever the cause, it is ordinary Kenyan families who suffer. And often, it’s mothers who toil alone. Thomas Matoke’s father has been absent for most of the past 30 years. Moraa says Matoke’s condition pushed him out. They have been chased away from village after village by angry, fearful neighbors. And soon, she fears, they will have to move away from this place as well. When the weather is good, she takes Thomas from his makeshift cell and ties him to an acacia tree outside. If she lets him go, he runs off. What she most wants is a place where he can get proper care. But she says there is little chance of that happening. The Kenya Certificate of Secondary Education national examinations results will be released on Monday. Close to 358,000 students who sat for the examination in October will know their fate when Education Minister Prof Sam Ongeri makes the much awaited announcement at the Kenya National Exam Council department of examinations administration in Hurlingham from 9am. The number of candidates who sat the exams rose from 336,156 in 2009 to 357,789. There is anxiety among the candidates as they await the results. Girls performed poorly last year and all eyes are on them to see if this time they will conquer the boys. Boys last year dominated the top 10 positions in the 2009 KCSE results with the first girl coming in the 11th position nationally. David Gathuku Ndung’u of Mangu High School emerged the best candidate in last year’s KCSE with 87.26 points. MOGADISHU (Reuters) – Somali’s hardline rebel group al Shabaab threatened on Sunday to attack neighbouring Kenya for training Somali government forces and allowing Ethiopian troops to operate from its towns. The group, which is aligned to al Qaeda, has said before that it would attack Kenya but so far has never done so. Last year, the insurgent group bombed Uganda in twin attacks that killed nearly 80 people. It said it was in retaliation for Kampala providing peacekeeping troops that have helped Somalia’s government stay in power. “Kenya has constantly disturbed us, and now it should face the consequences of allowing Ethiopian troops to attack us from Mandera town,” al Shabaab spokesman Sheikh Ali Mohamud Rage told a news conference. The threat comes in the wake of a new government offensive that has seen Somali forces claw back parts of Mogadishu. Somali troops backed by government-friendly militia have launched operations in several towns across central and southern Somalia including the al Shabaab-controlled border town of Balad Hawa, a few kilometres from the Kenyan town of Mandera, and Ethiopia. Somali troop numbers have been bolstered by the deployment of hundreds of new recruits trained in Kenya and Ethiopia, local residents and security sources say. “We have never openly fought Kenya but now we shall not tolerate any more. Kenya has been training soldiers to attack us. It has also given bases to Somali forces we drove away from Kismayu,” Rage said. Al Shabaab has also threatened to hit Ethiopia and Burundi, which has troops protecting the western-backed government in Mogadishu. Last year, a video posted on the Internet showed chanting men that claimed to be al Shabaab threatening to hit Nairobi for a crackdown on Somalis in the country. Al Shabaab spokesman Rage disowned the posting then and said he had no idea who was responsible for uploading it. Kenya has been a victim of al Qaeda strikes twice in the past — a 1998 bombing of the U.S. embassy in Nairobi and an explosion at an Israeli-owned hotel at the coast in 2002. The fighting in Somalia’s Balad Hawa has paralysed life in the Kenyan town of Mandera and forced residents with homes close to the boarder further inland, an aid official told Reuters. “Mandera is now a battle ground. Several stray bullets from Somalia and Ethiopia have come towards us. So far more than 15 people have been injured,” a staff member at a charitable organisation in Mandera told Reuters. Some foreigners working for international non-governmental organisations had also left the town for the capital, he said.